Super Smash Bros. designer Masahiro Sakurai took to Polygon to discuss the rigors of molding a polished and cohesive character roster. The following portion is all about Mega Man — how the character was secured and why he belongs. Click here for the full read. "Sakurai says the addition of Mega Man to the Smash Bros. Wii U and 3DS roster is a reflection of the winnowing down of candidates. He brings features and characteristics, like his ability to use various Robot Masters attacks, to the roster that you don't see in other characters, Sakurai says. Mega Man's addition came about at the behest of fans as well. After Sonic the Hedgehog — who appeared in Super Smash Bros. Brawl — Mega Man was the most requested guest character, Sakurai said. Getting Capcom's approval for Mega Man was easy, to hear Sakurai tell it. "We approached Capcom with the idea and they were very favorable and open to it," he said. Sakurai and the teams at Sora Ltd. and Namco Bandai focused on the classic NES-style of Mega Man, a chunkier, less angular, less sleek version of the character. 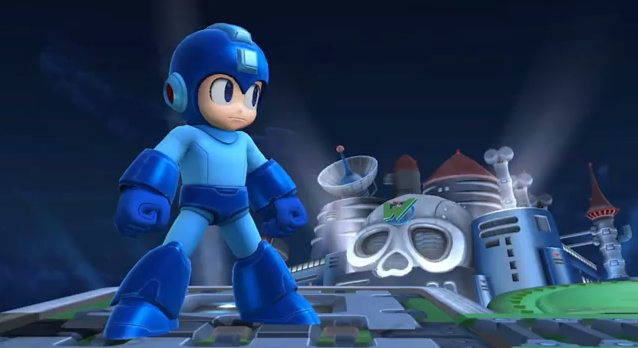 The Smash Bros. version of Mega Man focuses more on his ability to absorb others' powers, de-emphasizing punching and kicking. Mega Man's mega uppercut, which Sakurai says was inspired by the character's appearance in Marvel vs. Capcom, is one of his few melee attacks. "The approval process, in terms of how we're representing Mega Man, was actually really smooth and went really quickly." Mega Man was in huge demand back in the Brawl days. I'm really glad he got his due. He looks great, and I can't wait to see what they're going to do with him from here. So now the question remains. Does Sonic remain a one time thing in order to keep Brawls value up, or will he return alongside the Blue Bomber? I'm sure people will be asking the same thing about Solid Snake. I have a few favorites from Brawl that I would like to see return. Pokemon Trainer Red being one of them, or at least some other trainer in the same vein as he was. Glad we get to hear this sort of thing from Sakurai directly. I think it's obvious by now that Capcom doesn't know what to do with the MegaMan series themselves. But at least they've been willing to do this. Hopefully the fanbase will acknowledge that much. And whether he'll have any voice acting. If Sonic doesn't come back, I'll be very surprised. Snake, on the other hand, is less likely to return, I believe in part because there are no new Nintendo-exclusive Metal Gear games on the horizon. To be fair the last Metal Gear game for Nintendo before Brawl was that Metal Gear Solid remake, the last one before Smash 4 is the Metal Gear Solid 3 port for the 3DS. So, Capcom really does want to see Megaman in games. They just don't want to risk the money or effort. Also, I get the feeling the Mega Upper they speak of is from Battle/Power Fighters and they just say MvC as not to confuse people. Mega Upper IS from Battle/Power Fighters, but most people know it from the MvC series. Sakurai: "May we use Rockman in our next game?" Capcom: "Do we have to do any work?" Capcom: "Do we get a cut of the game profits?" Capcom: "Then go ahead. Just so long as it makes us money and we don't have to lift a finger." Sakurai: "Thank you, Capcom! The fans will be pleased!" "Now I'd like to know what involvement he has in the game's story mode : )"
"And whether he'll have any voice acting." Snake was involved in the story mode for Brawl since he was revealed from the start. Sonic was a last minute addition which is why we didn't see him until the very end. Mega Man will most likely be involved in whatever story is in the game. I also doubt him, or anyone else will have voice acting outside of grunts, moans, victory lines and whatever else they need to shout. "I get the feeling the Mega Upper they speak of is from Battle/Power Fighters and they just say MvC as not to confuse people." It's a direct quote from Sakurai. They can't change what he said and still have it as a direct quote. If he meant BF/PF, he would have said BF/PF. It's entirely possible Sakurai just never played Rockman 2: The Power Fighters. Not likely, considering his and his team's knowledge, but possible. It could even be a simple case of "Oh right! That was in that game, wasn't it? I forgot!" The Mega Upper in MvC _IS_ the Mega Upper in Power Fighters. I'm sure Sakurai mentioned MvC only because it's the more known of the 2 games. I do wish the Mega Upper was his up smash, instead of his up tilt attack. In the videos you can see MegaMan using SparkMan's electrode arms as a charged up smash attack. Mega Upper would have been alot cooler. b-b-but I thought people on BOTH sides made this happen, when Sakurai himself pretty much said Nintendo made this happen. I think this is a lesson don't trust anything Capcom says Protodude. You're an idiot. Read between the lines. And if Sakurai had said Capcom approached them, you'd say they were begging for a favor from Nintendo just to get the angry fans off their back. Why not just come out and admit you'll never be happy no matter what happened? Okay then, here goes. I'll never be happy with Capcom no matter what happened. Megaman's in Brawl, I'm psyched for that, but I have no trust in Capcom's word that they had a hand in this due to their past lies and undue credit grabbing (Rockman X Street Fighter anyone?) The only thing that will convince me to trust and like them again is if they release a high-quality Megaman game. With the publicity that Brawl will bring Rock, there's little doubt that Capcom will see viability in the franchise again, we'll get a new game, and everyone will be happy. Or satisfied, at least. That's how I see things playing out. in b4 die hard capcom fans tell you that you are just an ignorant hater, or stupid. Like the two who responded to me in the first place. I agree 100% with you cyberguy, Capcom gets no credit for this. "read between the lines" all you want, it's obvious Nintendo put the effort to get him in. As for admitting anger no matter what, please. I'm super hyped he's in the new Smash... in fact I'm getting a Wii U because of him. I just hate how Capcom is trying to take credit for this. Once they release a game then we'll see, but for now this is all Nintendo's doing. Capcom can spin it all they want, but there is a reason fans no longer trust them. Why do I get the feeling this and MOAR re-releases of the same 6 games are all this anniversary will entail? How the deal most likely went. Sakurai: May we use Rockman in Super Smash Bros? Sakurai: *Pulls out conveniant easy button and presses it* That was Easy!